Map of water storage and delivery facilities as well as major rivers and cities in the state of California. Central Valley Project systems are in red, and State Water Project in blue. Water and water rights are among the state's divisive political issues. Due to the lack of reliable dry season rainfall, water is limited in the most populous U.S. state. An ongoing debate is whether the state should increase the redistribution of water to its large agricultural and urban sectors, or increase conservation and preserve the natural ecosystems of the water sources. California's limited water supply comes from two main sources: surface water, or water that travels or gathers on the ground, like rivers, streams, and lakes; and groundwater, which is water that is pumped out from the ground. California has also begun producing a small amount of desalinated water, water that was once sea water, but has been purified. The largest groundwater reservoirs are found in the Central Valley. The majority of the supply there is in the form of runoff that seeps into the aquifer. The freshwater is usually found in deposits of gravel, silt, and sand. Below these deposits lies a layer of deep sediment, a relic of the era when the Pacific Ocean covered the area. Though California has laws governing surface water usage and quality, there exist no statewide groundwater management laws. Each groundwater basin is individually adjudicated to determine water rights. Otherwise, for all practical purposes, land ownership implicitly carries the right to virtually unlimited groundwater pumping. California has ten major drainage basins defined for convenience of water management. These basins are divided from one another by the crests of mountains. From north to south the basins are: North Coast, Sacramento River, North Lahontan, San Francisco Bay, San Joaquin River, Central Coast, Tulare Lake, South Lahontan, South Coast, and Colorado River regions. Each region incorporates watersheds from many rivers of similar clime. The Central and South Coast watersheds include the most populous regions of California – the San Francisco Bay Area, Los Angeles and San Diego – but have relatively little natural runoff, requiring the importation of water from other parts of the state. Rivers of the Lahontan watersheds in eastern California are part of the high desert Great Basin and do not drain to the Pacific. Most of the water is used locally in eastern California and western Nevada for irrigation. 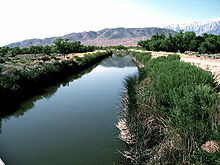 The Owens River of the South Lahontan region, however, is a principal source of water for Los Angeles. Rain typically falls in California only during the winter and spring months, from October through May, with more rain falling on the northern half of the state than the southern. Approximately 75 percent of the total precipitation volume occurs north of Sacramento, while 75 percent of the total water demand is in the south. With very rare exceptions, summers are dry throughout the state. Precipitation falling as snow in the Sierra and other mountain ranges feeds the network of reservoirs and surface water sources that supply the state; a low rainfall or light snowfall year can result in drought. Rivers in northern and coastal California are mainly rain fed, peaking from January to April and falling to very low levels between June and November. Snowmelt has a significant influence on the Sierra Nevada rivers from east of Sacramento to east of Bakersfield, which typically peak between April and July. Snowmelt is also the primary water source for the Colorado River which supplies southern California. In an average year, about 39% of California's water consumption, or 34.1 million acre feet (42.1 km3), is used for agricultural purposes. Of that total, 11%, or 8.9 million acre feet (11.0 km3) is not consumed by the farms for crop production but is instead recycled and reused by other water users, including environmental use, urban use, and agricultural use, yielding net water consumption for food and fiber production equal to 28% of California's water consumption, or 25.2 million acre feet (31.1 km3). This water irrigates almost 29 million acres (120,000 km2), which grows 350 different crops. Agricultural water usage varies depending on the amount of rainfall each year. There are six main systems of aqueducts and infrastructure that redistribute and transport water in California: the State Water Project, the Central Valley Project, several Colorado River delivery systems, the Los Angeles Aqueduct, the Tuolumne River/ Hetch Hetchy system, and the Mokelumne Aqueduct. The SWP system begins with reservoirs on upper tributaries of the Feather River. Oroville Dam creates the largest SWP reservoir. At 770 feet (230 m) above the riverbed, the dam is the tallest in the United States. The reservoir covers 15,000 acres (61 km2) and holds 3.5 million acre feet (4.3 km3). Water travels from Lake Oroville to the Sacramento River. At Harvey O. Banks Delta Pumping Plant, which pulls SWP water into the Bethany Reservoir, around 2.2 million acre feet (2.7 km3) are extracted from the Delta each year. Water that flows to the south end of the San Joaquin Valley must be pumped over the Tehachapi Mountains. Because of this, the SWP is California's largest energy consumer, and even though the hydroelectric plants of the SWP generate 5,900 GWh per year, that is only a fraction of the energy needed to lift water over the Tehachapis. Below the Tehachapis the California Aqueduct splits, with the west branch storing water in Castaic and Pyramid Lake, and the east branch storing water in the Silverwood Lake reservoir. The CVP's original purpose was to tame seasonal flooding and to direct water to the south to irrigate 3 million acres (12,000 km2) of farmland. The CVP is operated by the United States Bureau of Reclamation. As one of the largest water systems in the world it stores over 7 million acre feet (8.6 km3) of water, or 17 percent of the state's developed water. The CVP dams and diverts five major rivers: the Trinity, the Sacramento, the American, the Stanislaus, and the San Joaquin. Friant Dam, on the San Joaquin, was completed in 1944, forming Millerton Lake. This was one of 20 reservoirs in the CVP. Shasta Dam, the largest CVP storage facility, was completed in 1945. At Sacramento, American River water stored by Folsom Dam is added. 2.5 million acre feet (3.1 km3) are annually pumped from the Delta into the Delta-Mendota Canal. New Melones Dam on the Stanislaus River was finished in 1979, and the reservoir was filled in 1982. The Colorado River is the source of 4.4 million acre feet (5.4 km3) per year for California. Six other states along the river's watershed ( Wyoming, Nevada, Utah, Colorado, New Mexico, and Arizona) and Mexico, share allocated portions of river water. The Metropolitan Water District of Southern California, or MWD, holds priority water rights on the Colorado. It sells water to 95 percent of the South Coast region. Lake Mead, formed by Hoover Dam, is the primary reservoir in the Colorado River basin. The Colorado River Aqueduct begins 155 miles (249 km) downstream from Hoover Dam, and can carry 1.2 million acre feet (1.5 km3) annually. An additional system diverts water from the Colorado River at the Imperial Diversion Dam provides waters to the Imperial and Coachella valleys as well as Yuma, Arizona, via the Alamo Canal, the Coachella Canal and the All-American Canal, which runs alongside the Mexican border. This system was also responsible for the accidental re-creation of the Salton Sea in 1905. The Colorado is considered over-allocated, because apportionments were made on inaccurate measurements of annual runoff. Marc Reisner in Cadillac Desert noted that the Colorado is "unable to satisfy all the demands on it, so it is referred to as a 'deficit' river, as if the river were somehow at fault for its overuse". For years California took more than its share of the apportionment, because other states were not prepared to use their entire allotments. MWD became used to 0.8 million acre feet (0.99 km3) excess of water. Pressure from other Colorado river states caused the Secretary of the Interior to order California to show progress towards decreasing its dependency on the excess 0.8 million acre feet (0.99 km3), or face cuts. The Colorado River Water Use Plan called for Imperial and Coachella Valley agriculture to give up water in order to reallocate 0.8 million acre feet (0.99 km3) within the state. The plan's proposals generated much controversy, and the deadline arrived with no agreement reached. The Department of the Interior reduced MWD's access by 0.415 million acre feet (0.512 km3). The East Bay Municipal Utility District (EBMUD) serves 35 communities in Alameda and Contra Costa Counties, including Berkeley and Oakland. The Mokelumne River in the central Sierra Nevada is the source for almost all of EBMUD's water. EBMUD built the Pardee Dam across the Mokelumne in the foothills northeast of Stockton. South of Pardee is Camanche Reservoir, which regulates releases to serve downstream water rights holders. EBMUD holds almost 30,000 acres (120 km2) in the Mokulumne River watershed and 25,000 acres (100 km2) in other watersheds. EBMUD also has an American River water right that could be sent to the Mokelumne Aqueduct through the Folsom South Canal. The only time this has been done was during the drought years of 1977–78, when the water was actually pumped from the Delta. This generated controversy, as EBMUD preferred the cleaner water from the American River, but environmentalists and Sacramento had concerns about the impacts such a diversion would have on the river. The legal battle led to affirmation of EBMUD's water right, but modifications were also negotiated. The intake point was moved downstream, to maintain minimum flows in the American River before it merges with the Sacramento. The North Bay Aqueduct of the California State Water Project delivers an annual average of 39,309 acre feet (0.048487 km3) of water to urban communities and agricultural users in Napa, Solano, Sonoma and Marin counties. That water is diverted from the Sacramento-San Joaquin River Delta Estuary, a water hub that serves as the junction of south-, west, and north-flowing rivers draining the Cascade and Sierra Nevada mountain ranges. Certain municipalities north of San Francisco Bay, including Santa Rosa and Petaluma, are served by the Sonoma County Water Agency. Their primary water source is the Russian River. However, it must be noted that the Russian River owes its summer flow in large part to the Eel, which is bled off via a tunnel into Potter Valley (via the Potter Valley Project) and flows to a reservoir near Ukiah, Lake Mendocino. PG&E now owns the rights to this delivery system, as well as the long controversial history. There are many[ who?] along the Eel who would like their water back. The cities of Vallejo, Fairfield, and Vacaville are served by the Solano County Water Agency, which transports water from Lake Berryessa and moves it south along the Putah South Canal. Marin County has the Marin Municipal Water District and the North Marin Water District. The planning and management of water in California is subject to a vast number of laws, regulations, management plans, and historic water rights. The state agency responsible for water planning is the California Department of Water Resources. There have been several documents known as the "California Water Plan", with the most recent being published in 2013. Before the state of California started drafting comprehensive plans for the management of water in the state, the earliest plan for water distribution in California was an 1873 report. This was followed by a 1919 report called "Irrigation of Twelve Million Acres in the Valley of California". The 1919 report is the first comprehensive plan, and is often called the "Marshall Plan", after its author Col. Robert Bradford Marshall. There have been many subsequent water plans and water plan updates, which were often issued as California Department of Water Resources bulletins. California Water Code provides guidance or the plan updates. Beginning in 1957, early Water Plan Updates were largely technical and focused on water supply development. Plans gradually became more comprehensive to address the state's growing conflicts over limited resources. Updates now present the status and trends of California's water-dependent natural resources; water supplies; and agricultural, urban, and environmental water demands for a range of plausible future scenarios. They also evaluate different combinations of regional and statewide resource management strategies to reduce water demand, increase water supply, reduce flood risk, improve water quality, and enhance environmental and resource stewardship. The evaluations and assessments performed for the updates help identify effective actions and policies for meeting California's resource management objectives in the near term and for several decades to come. Since 2000, another major goal for each update has been to receive broad input and support from Californians. Preparation of these new millennial Water Plan updates has been widely viewed as exceptionally transparent and collaborative as the consensus seeking process is routinely cited by other agencies and states as a model for policy planning efforts. The approach involves: interest based dialog and exchange among teams, committees and the public to develop work products; multiple opportunities for review by different audiences; and integration and reconciliation of feedback from a variety of perspectives. Update 2013 is based on the plan laid out by the administration of Governor Edmund G. Brown Jr. ( Jerry Brown). That five-year plan, released in January 2014, outlines a succinct set of actions that together bring reliability, restoration, and resilience to California water resources, even as the state's population is expected to grow from 38 million to 50 million by 2049. Three related themes distinguish Update 2013 from Update 2009. The five year time span reinforced the value of integrated water management, and Update 2013 closely examines the practices and policies that allow water managers to combine flood management, environmental stewardship, and surface water and groundwater supply actions to deliver multiple benefits across a region. Fundamental to that integrated approach is better alignment in the management of data, planning, policy-making, and regulation across local, State, tribal, and federal governments. On more than one occasion, the California Supreme Court has noted that "the scope and technical complexity of issues concerning water resource management are unequalled by virtually any other type of activity presented to the courts." An example of this complexity is demonstrated in the case of National Audubon Society v. Superior Court. California recognizes water rights granted to pueblos (settlements) under the Spanish and Mexican governments, prior to the Treaty of Guadalupe Hidalgo. Under the doctrine, pueblos organized under the laws of Mexico or Spain have a water right to the yield of all streams and rivers flowing through the city and the groundwater aquifers lying below. Pueblo water rights are superior to all riparian and appropriative rights and cannot be lost by a failure to assert an interest or use the water. In addition, the pueblo's claim expands with the needs of the city and may be used to supply the needs of areas that are later annexed to the city. Los Angeles and San Diego are the only original pueblos to exercise their pueblo water rights in the courts. Exclusive right is given to the original appropriator, and all following rights are conditional upon precedent rights. All rights are conditional upon beneficial use. Diversion is permitted, regardless of the shrinkage of the river or stream. Beneficial use is defined as agricultural, industrial, or urban use. Environmental uses, such as maintaining body of water and the wildlife that use it, were not initially regarded as beneficial uses in some states but have been accepted in some areas. Every water right is parameterized by an annual yield and an appropriation date. When a water right is sold, it maintains its original appropriation date. 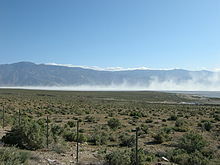 Dust blowing in the bed of Owens Lake in 2008. The lake went dry after diversions of its water to Los Angeles in the 1910s–20s. It is projected that California's population will grow to almost 50 million by 2050. If the prediction comes true and there is no action to increase the water supply, the difference between water demand and supply would be between 2.0–6.0 million acre feet (2.5–7.4 km3) in the year 2020. Over the past five years California voters have approved $3 billion in bonds for water development and management. [ when?] Many of these projects are incorporated in the CALFED Bay-Delta program, a federal-state program designed to reduce water supply conflicts. In August 2000 the state and federal governments approved the CALFED plan for water quality, water conservation and recycling, watershed administration, ecosystem re-establishment, delta levees, surface and groundwater storage, water transportation, and science. The plan has a thirty-year implementation period and was designed to incorporate changes in conditions and knowledge about the effects of specific projects. Stage 1 was initiated in 2000 and was designed as a seven-year program. The cost is estimated to be $8.7 billion. Stage 1 water yield within the next seven to ten years is estimated to be 2.9 million acre feet (3.6 km3) per year. As part of Stage 1, an Environmental Water Account was established through the purchase of 0.35 million acre feet (0.43 km3) of water. The EWA is used to protect fish and other wildlife without reducing water allocations to farms and municipalities. The California Water Documents collection in the Claremont Colleges Digital Library is a valuable online resource of archived materials related to California's water history. Additionally, the collection has digitized materials relating to the creation and operation of both the Central Valley Project and the California State Water Project as well as their component units. The items represented in the Claremont Colleges Digital Library are part of a larger collection entitled the Water Resources Collection in Special Collections at Claremont Colleges' Honnold/Mudd Library. The Water Resources Collection was started in the 1930s by Librarian Willis Holmes Kerr and Librarian and Claremont Colleges' Trustee John Treanor. These librarians' interest in California's water problem led them to start collecting a variety of documents related to water history and usage from around the state. It includes reports of engineers, annual reports and minute books of boards of directors of water companies, documents of federal and state governments, promotional pamphlets, and newspaper clippings. Most of the documents focus on the water history from the first half of the 20th century, but there are additional, more recent publications included, which have been donated by Claremont Graduate University Professor Merrill Goodall. The California Water Documents collection is currently a work in progress at the Claremont Colleges Digital Library. The Water Resources Collections and Archives is located at the University of California, Riverside and features a comprehensive collection of water-resource related documents. ^ a b "Riparian Rights". Water Education Foundation. Retrieved 2018-05-10. ^ Hundley, N. (2001). The great thirst: Californians and water. Berkeley, California: University of California Press. ^ Jenkins, Marion W.; Lund, Jay R.; Howitt, Richard E.; Draper, Andrew J.; Msangi, Siwa M.; Tanaka, Stacy K.; Ritzema, Randall S.; Marques, Guilherme F. (2004). "Optimization of California's Water Supply System: Results and Insights". Journal of Water Resources Planning and Management. 130 (4): 271–280. doi: 10.1061/(ASCE)0733-9496(2004)130:4(271). ^ a b c d Carle (2004), p. 60. ^ City of Pasadena v. City of Alhambra , 33 Cal.2d 908 (Cal. 1949). ^ Alley, William M.; Healy, Richard W.; LaBaugh, James W.; Reilly, Thomas E. (2002). "Flow and Storage in Groundwater Systems". Science. 296 (5575): 1985. Bibcode: 2002Sci...296.1985A. doi: 10.1126/science.1067123. ^ Moores, Eldridge M. (1999). Classic Cordilleran Concepts: A View from California. Geological Society of America. ^ "NASA's GRACE Sees a Drying California". Photojournal.jpl.nasa.gov. NASA. June 2014. Retrieved October 4, 2014. ^ Kenneth W. Umbach (August 1997). "A Statistical Tour of California's Great Central Valley". Archived from the original on 2017-04-04. ^ a b "California State Water Project–Sacramento San Joaquin Delta". Water.ca.gov. Retrieved 14 October 2017. ^ "California's Three Traditionally Wettest Months End With Statewide Snowpack Water Content Less than Average" (PDF). Water.ca.gov. Retrieved 17 October 2017. ^ "Welcome – California Water Plan". Waterplan.water.ca.gov. State of California. Retrieved 14 October 2017. ^ "California". Crwua.org. Retrieved 14 October 2017. ^ a b c Carle (2004). ^ "Monthly Data by Water Year". California Data Exchange Center. California Department of Water Resources. Retrieved 9 November 2014. ^ Cooley, Heather; Gleick, Peter; Hartman Wolff, Gary (2006). Desalination, with a grain of salt a California perspective. Oakland, Ca: Pacific Institute for Studies in Development, Environment, and Security. pp. 39–68. ISBN 1-893790-13-4. ^ "Carlsbad Desal Plant". Poseidon Water. Retrieved 2017-07-30. ^ "Seawater Desalination". Sdcwa.org. Retrieved 2017-07-30. ^ "Existing and Proposed Seawater Desalination Plants in California – Pacific Institute". Pacific Institute. Retrieved 2017-07-30. ^ "Suggestions for sustainable sanitation". issuu. Retrieved 2017-04-08. ^ Jeffrey Mount; Emma Freeman; Jay Lund. "Water Use in California". PPIC. Retrieved 21 October 2014. ^ a b "Water—Who uses how much?". Californiawaterblog.com. 5 May 2011. Retrieved 17 October 2017. ^ "Sacramento-San Joaquin Delta and Salinity". Water Education Foundation. Retrieved 6 December 2015. ^ Heather Hacking. "Releases from Lake Oroville increased to keep salt water out of the delta". Chico Enterprise-Record. Retrieved 6 December 2015. ^ "U.S. Geological Survey" (PDF). Pubs.usgs.gov. Retrieved 16 October 2017. ^ a b c "Volume 5 - Technical". California Water Plan. State of California. 2013. Archived from the original on 2015-04-10. Retrieved 14 October 2017. ^ a b David Pierson (8 June 2014). "U.S. farmers making hay with alfalfa exports to China". Los Angeles Times. ^ Weiser, Matt (8 March 2016). "Saudi Arabia moves farming venture to drought-stricken California". Newspaper. The Guardian. Retrieved 9 March 2016. ^ "California Rice at a Glance" (PDF). Calrice.org. Retrieved 14 October 2017. ^ Mekonnen, M. M.; Hoekstra, A. Y. (2011). "The green, blue and grey water footprint of crops and derived crop products". Hydrology and Earth System Sciences. 15 (15): 1577–1600. Bibcode: 2011HESS...15.1577M. doi: 10.5194/hess-15-1577-2011. ^ Buchanan, Larry; Keller, Josh; Park, Haeyoun (21 May 2015). "Your Contribution to the California Drought". New York Times. Retrieved 16 September 2015. ^ Mike Madison (24 August 2011). "Horses among us,". Los Angeles Times. ^ Gussow, Joan Dye. This Organic Life: Confessions of a Suburban Homesteader. White River Junction, VT: Chelsea Green Pub., 2001. Print. ^ "USGS: Livestock Water Use in the United States". water.usgs.gov. Retrieved 2018-03-04. ^ "California Single Family Water Use Efficiency Study" (PDF). Irwd.com. Retrieved 16 October 2017. ^ "How Much Water Do Californians Use and What Does A 20 Percent Cut Look Like?". KQED News. 28 January 2014. Retrieved 9 February 2015. ^ "Outdoor Water Conservation". Green Cities California. Archived from the original on 2015-04-05. ^ a b Rogers, Paul & Nicholas St. Fleur (7 February 2014). "California Drought: Database Shows Big Difference between Water Guzzlers and Sippers". San Jose Mercury News. ^ Buck, Steven; Nemati, Mehdi; Sunding, David (2016). "The Welfare Consequences of the 2015 California Drought Mandate: Evidence from New Results on Monthly Water Demand" (PDF). Retrieved 1 July 2016. ^ "California State Water Project Overview". Department of Water Resources. Retrieved November 2, 2014. ^ Carle (2004), p. 92. ^ Dickinson, Ann (June 5, 2008). "Where Water Runs Uphill". Quest Community Science Blog. KQED. ^ About Our Valley. California, Central Valley, and San Joaquin Valley Agriculture. ^ Bureau of Reclamation. Central Valley Project: General Overview. ^ "Leaky Water Law". Los Angeles Times. 1987-04-15. ISSN 0458-3035. Retrieved 2017-10-17. ^ Stene, Eric A. "The Central Valley Project". Bureau of Reclamation: Reclamation Project Histories. ^ Metropolitan Water District of Southern California. California's Colorado River Allocation. ^ a b Reisner, Marc (1993). Cadillac Desert: The American West and its Disappearing Water. Penguin. ISBN 0140178244. ^ Carle (2004), pp. 113–114. ^ "The L.A. Aqueduct at 100". graphics.latimes.com. Retrieved 2017-10-17. ^ "State Decision Offers Good News for Mono Lake". Monolake.org. Retrieved 14 October 2017. ^ "Ultra-Low Flush Toilet Distribution Program". Monolake.org. Retrieved 14 October 2017. ^ "Hetch Hetchy Water and Power : Financial Statements 2013/14". Stwater.org. Retrieved 17 October 2017. ^ Null, Sarah E. (2003). Re-Assembling Hetch Hetchy: Water Supply Implications for Removing O'Shaughnessy Dam (M.A. thesis). Davis: University of California. ^ "Flint's Water Is a Tiny Part of America's Huge Drinking Problem, Says Study". Inverse. Retrieved 2018-03-13. ^ "Systemic Failure: Why 1 Million Californians Lack Safe Drinking Water". Water. Retrieved 2018-03-06. ^ "'Hot spots' of water quality violations: Problems more frequent in low-income, rural areas of the nation". ScienceDaily. Retrieved 2018-03-13. ^ Fram, Miranda S.; Belitz, Kenneth (August 2011). "Occurrence and concentrations of pharmaceutical compounds in groundwater used for public drinking-water supply in California". Science of the Total Environment. 409 (18): 3409–3417. Bibcode: 2011ScTEn.409.3409F. doi: 10.1016/j.scitotenv.2011.05.053. ISSN 0048-9697. ^ "California Water Plan Update 2013". California Department of Water Resources. Retrieved Oct 30, 2014. ^ "California Water Plan". UC Davis Library. Retrieved Oct 25, 2013. ^ "List of Legislative Requirements". Waterplan.water.ca.gov. Retrieved 19 September 2014. ^ "List of US State Water Plans". Circleofblue.org. Retrieved 13 February 2014. ^ "Water Action Plan". Waterplan.water.ca.gov. Retrieved 22 January 2014. ^ a b San Diego v. Cuyamaca Water Co, 209 Cal. 105 (1930). ^ United States v. State Water Res. Control Bd., 182 Cal.App.3d 82 (1986) (citing Miller & Lux v. Enterprise Canal & Land Co., 169 Cal. 415 (1915)). ^ Chief Justice Lucien Shaw, Development of the Law of Waters in the West, 10 Cal. L. Rev. 443 (1922). ^ Brian Gray, A primer on California Water Transfer Law, 31 Ariz. L. Rev. 745 (1989). ^ Clay, Karen, and Gavin Wright. Order without law? Property rights during the California gold rush. Explorations in Economic History 42 (2005): 155–183. See also Jennison v. Kirk, 98 U.S. 453 (1878). ^ Brian Gray, In Search of Bigfoot: The Common Law Origins of Article X, Section 2 of the California Constitution, 17 Hastings Const. L.Q. 225 (1989). ^ Eric Freyfogle, Context and Accommodation in Modern Property Law, 41 Stan. L. Rev. 1529 (1989), discussing In re Waters of Long Valley Creek Stream System, 25 Ca.3d 339 (1979). ^ United States v. State Water Res. Control Bd., 182 Cal.App.3d 82 (1986) (citing Meridian, Ltd. v. San Francisco 13 Cal.2d 424, 445–447 (1939)). ^ United States v. State Water Res. Control Bd., 182 Cal.App.3d 82 (1986) (citing Irwin v. Phillips, 5 Cal. 140, 147 (1855)). ^ Gopalakrishnan, Chennat (1973). "The Doctrine of Prior Appropriation and Its Impact on Water Development: A Critical Survey". American Journal of Economics and Sociology. 32 (1). pp. 61–72. ^ Wilson, Craig. "California's Area of Origin Laws" (PDF). Retrieved 24 February 2016. ^ a b Green 2007, pp. 23–24. ^ Green 2007, pp. 83–84. ^ Green 2007, p. 56. ^ Byrne, Peter. "Delusions of Power". SF Weekly. Retrieved 16 October 2017. ^ "California Salmon Could Be Harmed By More Dams". Science Daily. September 27, 2007. Retrieved November 2, 2014. ^ "California's Housing Future: Challenges and Opportunities. Public Draft – Statewide Housing Assessment 2025" (PDF). January 2017. Retrieved 16 October 2017. ^ a b Chung, Francis; Kelly, Katherine; Guivetchi, Kamyar (2002). "Averting a California Water Crisis". Journal of Water Resources Planning & Management. 128 (4): 237–239. doi: 10.1061/(ASCE)0733-9496(2002)128:4(237). ^ "California Proposition 1, Water Bond (2014)". Ballotpedia.org. Retrieved 14 October 2017. ^ Respaut, Robin. "Californian voters support water bond two-to-one, poll finds". Retrieved 14 September 2014. ^ "Drought background". California Department of Water Resources. Retrieved October 26, 2014. ^ "Major Floods and Droughts in California". USGS. ^ a b c Colleges, Special Collections at the Libraries of The Claremont. "Water Resources Collection – Special Collections at the Libraries of The Claremont Colleges". Libraries.claremont.edu. Retrieved 17 October 2017. Carle, David (2004). Introduction to Water in California. Berkeley: University of California Press. Green, Dorothy (2007). Managing Water: Avoiding Crisis in California. University of California Press. ISBN 978-0-520-25326-1. OCLC 85692856. Warner, Richard E.; Hendrix, Kathleen M. (1984). California Riparian Systems: Ecology, Conservation, and Productive Management. University of California Press. p. 1035. ISBN 9780520050358.